All cookies we use are first-party cookies. You might end up serving third party cookies by embedding external content like YouTube videos, but this is beyond the scope of this article. Functional cookies are cookies required to providing the service. This includes cookies like session cookies or to store preferences. They cannot be turned off, their role is purely to make the user experience more enjoyable and no personal information is contained within these cookies. Timelapse provides analytics on how people use your Help Center. To make this possible, our analytics platform rely on cookies, so first party cookies are used to identify each visitor and each visit. These cookies are considered optional and Timelapse provides a way for your visitors to opt-out of tracking, both from Google Analytics and our analytics engine. IP Anonymization -- IP addresses are considered Personal Identifiable Information and for this reason, as of May 23, 2018, all IPs stored by our analytics engine are anonymized. If you're using our Google Analytics integration, IP Anonymization is on by default too. Learn more about IP Anonymization. Anonymous Search data -- Every search made through your Help Center are saved so you can better understand what people search for. Search data is not linked to any user data. As a result, all searches are anonymous. 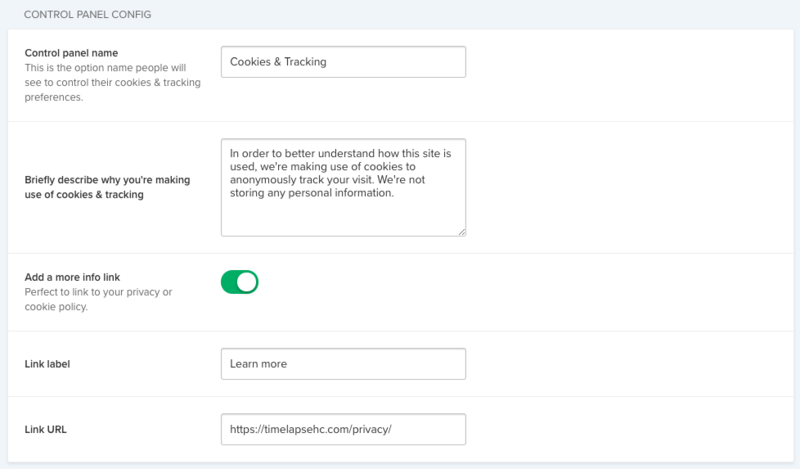 Cookies & Tracking Control Panel -- if you're required or simply want to provide a way for your visitors to opt-out of tracking, Timelapse offers a way for your visitors to do so. The same option can be used to ask for consent before doing any sort of tracking. Turn off Google Analytics tracking if enabled. Existing Google Analytics cookies won't be deleted since they're out of our control, but we'll tell Google Analytics to stop registering page views through their user opt-out feature. 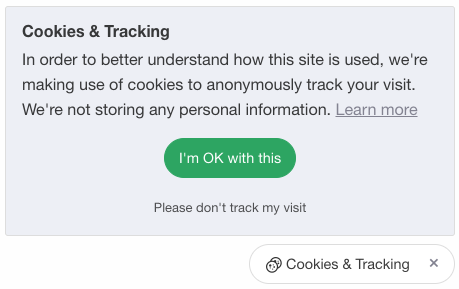 If your visitors are located within the European Union, you might be required to ask for consent before doing any sort of tracking or storing cookies. Still from the same screen, enable the Ask for explicit consent option in the Restrict tracking and cookies panel. Configure the labels for the accept and deny cookies options and a message similar to this one will be displayed automatically to all your visitors. 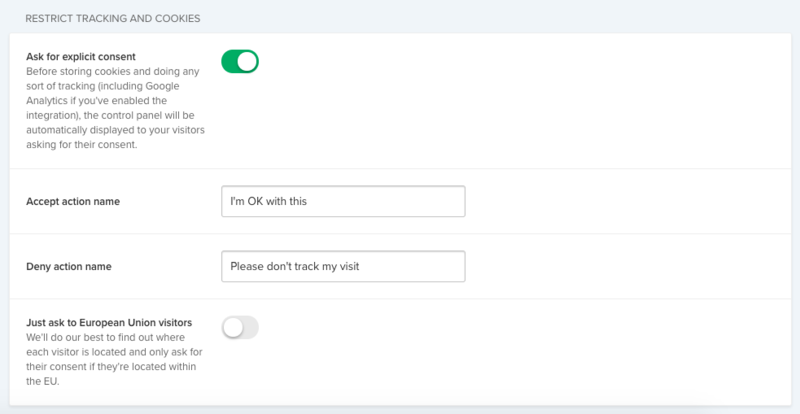 Take note that tracking and cookies will be turned off until your visitors have agreed, thus impacting analytics accuracy. If you enable this option, we'll do our best to figure out where each visitor is coming from and only ask for consent to visitors coming from the EU. 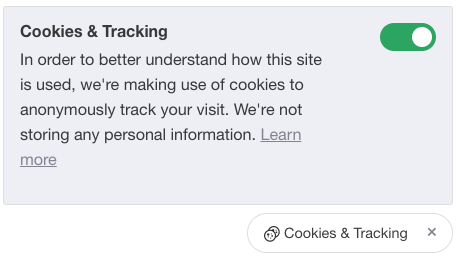 Tracking and cookies will be turned on by default for all other visitors.